Familiarise yourself with the full material from Ericsson. Below we highlight a few findings that we think are particularly interesting – especially those that challenge the ‘conventional wisdom’ of our industry. Even though the situation is a bit better to the right in the graph – in the US, the UK, Germany, Mexico and Finland – the figures aren’t low there either. 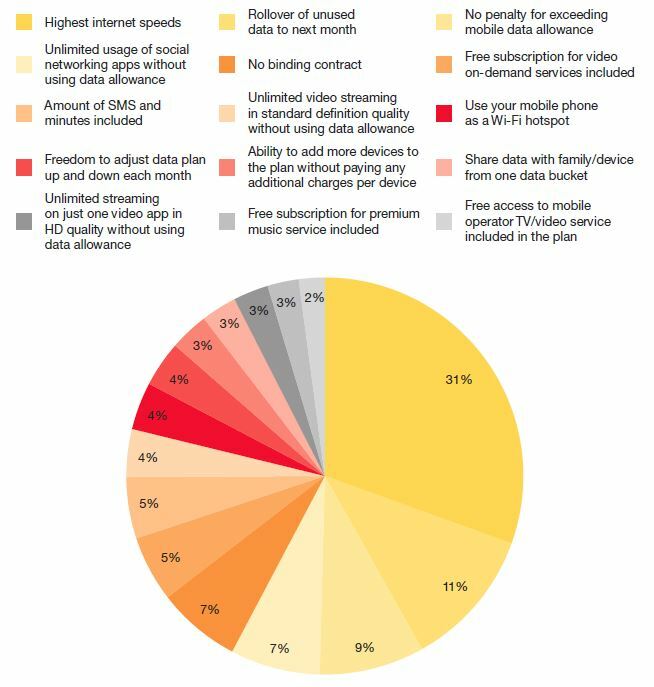 Half of all users overall say that they experience data plan distress and limit their usage due to the fear of being hit by overage fees. Which leads us to the next call to action. Here’s the first myth that the Ericsson ConsumerLab research busts: 70% of users on unlimited data plans are not in the heavy user category. Most users on unlimited mobile data plans still used 2.5 times more Wi-Fi than cellular data – even though they shouldn’t need to. The research shows that the primary motivation for consumers to buy unlimited plans isn’t to consume a lot. It is instead peace of mind that these consumers are after – reducing the fear of receiving penalties when exceeding data allowances. 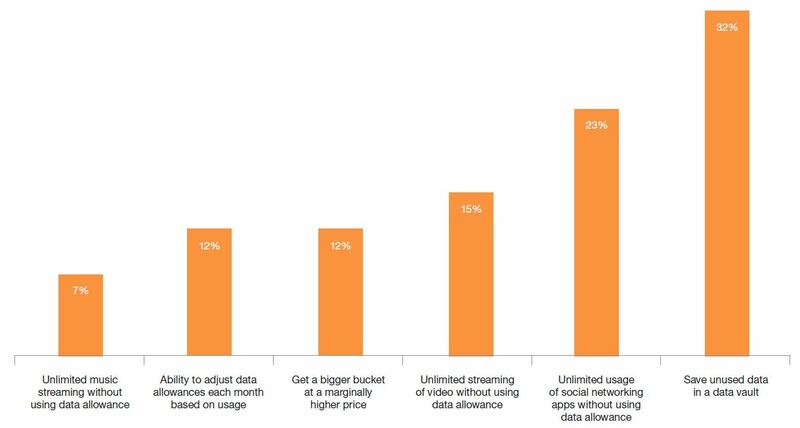 While in the myth busting mode, the survey also shows that users on large enough capped plans are equally happy with the network performance as users on unlimited plans. This is different than the US specific findings reported by J. D. Power: That unlimited customers have a much more positive perception of their network’s quality. Consumers are overly worried about their data allowances. Only 15% of the surveyed smartphone users with capped data actually exceed their allowance. By contrast, 41% consume much less data than what they have bought. 76% of the surveyed smartphone users with data left want the unused data to roll over. 44% of them are even willing to pay for it. And here’s a small myth busted: Even if they could, they are less likely to share their unused data with family members or friends – a proposition quite a few operators support and even charge for. Rollover is king, but only 19% of the smartphone users in the survey have it. Image from Indosat Ooredoo. “Sisa kuota” is Indonesian for “Remaining quota” and the image captures the consumer sentiment of the survey. The preferences can however be different for different markets and we encourage operators in the fourteen surveyed countries to reach out to Ericsson ConsumerLab to agree on further sharing. 5G isn’t here yet, but the research shows that consumers are interested – and that’s a good start. But the expectations are high – not to say sky high. In part this is because only half of the smartphone users globally say that their expectations on network performance are met. 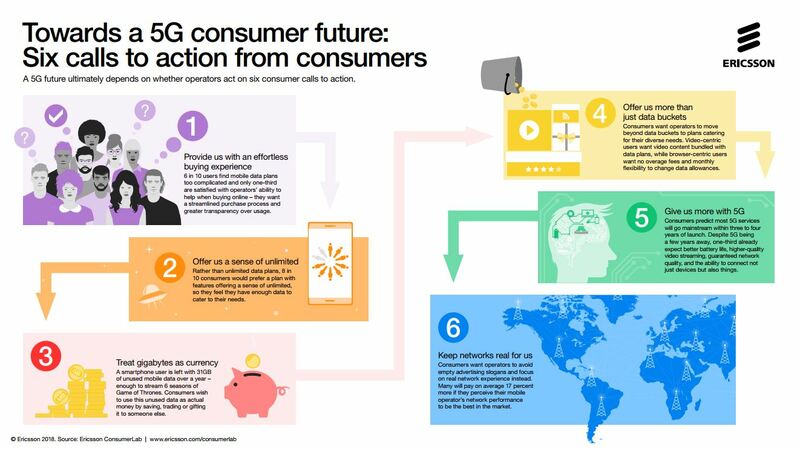 Consumers might feel that 5G is needed to fulfill them. 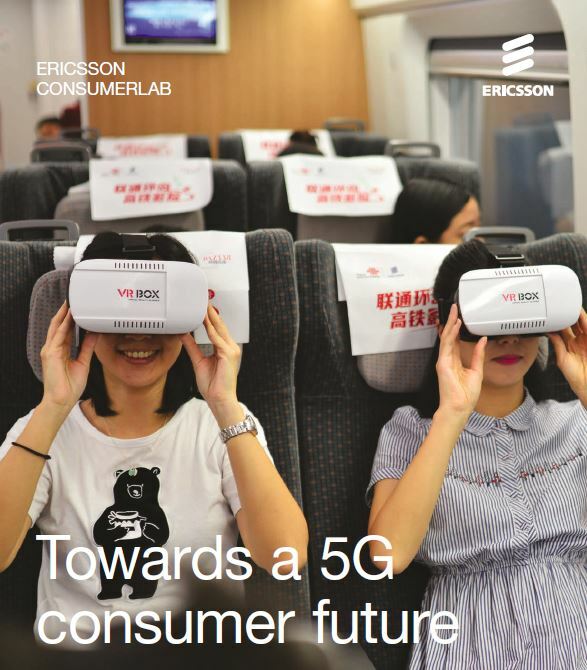 What we find interesting in the results is also that 57% of the smartphone users want to see the elimination of the bucket plan in 5G: Per-gigabyte charging should be replaced with a fee for each 5G service or for each 5G device. The final call for action excites us. Consumers want their operator to have the best network. But what drives the perception of the best network? Well, it’s not what operators say. The graph above shows that only 4% of the smartphone users surveyed think that operators’ ads and marketing are the most credible sources of information. An equally low 4% think that a report coming from an operator is the most credible. So if consumers don’t trust operator statements on network quality, who do they trust? 46% think that their own experience is the most credible, followed by family and friends with 17%. Speed tests, third-party reports and regulator reports also have some impact on the perception. Consumers that perceive their operator having the best network are more loyal – 1.7 times less likely to churn – and more likely to recommend it – their NPS score is 48 points higher. About 70% of the consumers believing that they are on the best network mean their operator provides the best value for money. Yes, they really do. Users who believe they are on the best network averagely spend 17% more per month on services. If you already own ‘the best network’ perception – defend it. Almost at all costs. If you don’t – try to take ownership. But since consumers trust themselves more than they trust you, it’s likely not happening through a campaign or through a network test paid by yourself. You might actually have to build the best network first and then, over time, be rewarded with ‘the best network’ perception based on the actual experience of customers.